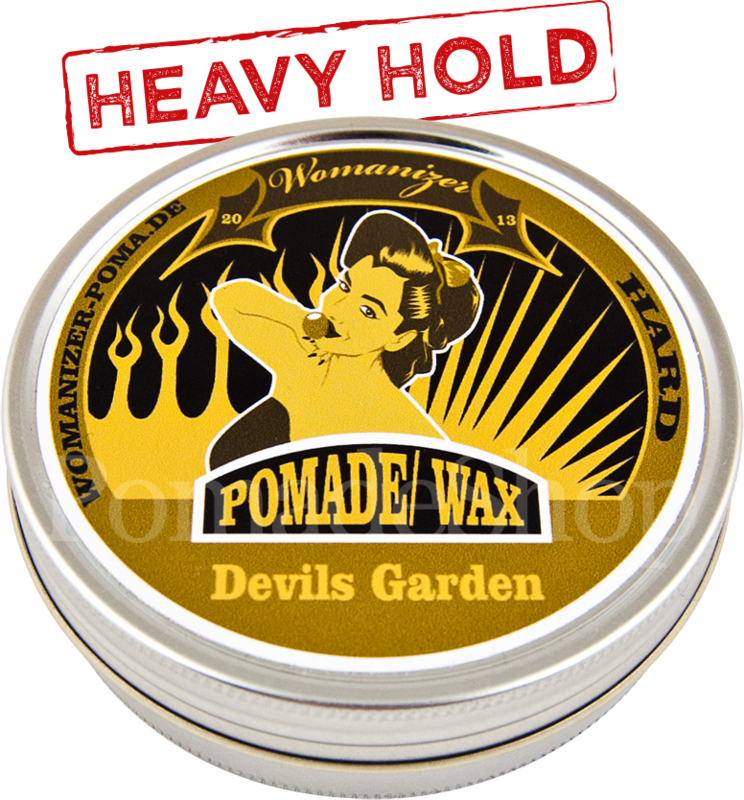 Product information "Womanizer Pomade - Devils Garden"
Cult pomade with a very firm hold and an aromatic vanilla and wild cherry fragrance of the 1980s. For taming extremely unruly hair. Handmade by the great pomade fan Carsten Sommer in Lower Saxony, Germany. 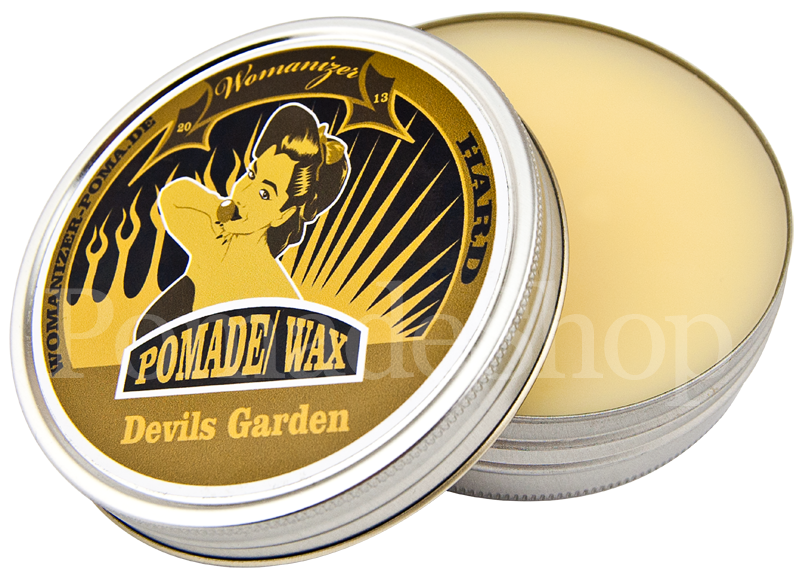 The pomade of the WOMANIZER series with the scent “Devils Garden" is a hard wax-pomade for extremely unruly hair and firm hairstyles. The high light of this pomade is the fragrance that will inspire all fans of strong vanille and wild cherry chewing scents. All pomades of the WOMANIZER (men) and VAMP (ladies) range offer the same level of hardness, the same very firm hold and the same traditional ingredients like beeswax, petrolatum, lanolin, coconut oil and microwax, as well as moisturizing jojoba. The difference between the pomades is also their high light: spectacular fragrances inspired by timeless women's and men's perfumes. Just sniffing the Womanizer and Vamp pomades and recognizing these fragrance templates is an experience in itself. And you don’t want to wait to try each one after the other in your hair. That the Vamp series is actually intended for ladies and the Womanizer series for men is quickly forgotten. The pomades are made by hand, with great pride and with the best ingredients in Lower Saxony. Behind the Womanizer and Vamp Pomaden is one of the very big pomade fans and tinkerers: Carsten Sommer, who has been dedicated since 2013 with passion to the creation and production of pomades. Draw some pomade out with the back of the nail - alternatively you can blow-dry the pomade softly. Rub it between the palms and massage it into the hair. Then comb the hair into the desired shape, with a hairbrush add more structure and volume in the hairstyle. Finished. links to "Womanizer Pomade - Devils Garden"
customer reviews on "Womanizer Pomade - Devils Garden"
Der Wildkirsch-Duft wirft mich sofort um einige Jahrzehnte zurück in meine Kindheit. Ich musste direkt an diese kleinen Kirschlutscher denken, die in den 80ern recht populär waren. Ich tue mich persönlich ein bisschen schwer, bei Womanizer die richtige Dosierung zu finden. Aber das ist ein lösbares Problem. Prima Produkt! Angenehmer Duft, lässt sich Gute verarbeiten, Hält Gut.